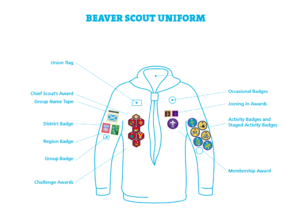 Every member of the 14th Cambridge Scout Group wears uniform, which could be purchased from the Cambridge District Scout Shop when young people are ready to become official members. The Group has a black and red necker for all 3 sections. Group scarf. The scarf is positioned round the neck and held together with a woggle. Group scarf. The scarf is positioned round the neck and held together with a plastic woggle.